florida girl in dc: Paella-palooza! Chef Andres Hits the Farmers Market This Sunday. Paella-palooza! Chef Andres Hits the Farmers Market This Sunday. I'm back in DC and plotting my Memorial Weekend farmers marketing. This morning, I'm going to hit up Arlington Farmers Market for my favorite scone at Atwater's Bakery. But, I'm holding off on my major ingredient purchasing for tomorrow's Dupont Circle Farmers Market for one reason, and one reason only... Chef Jose Andres will be in the house making his GIANT PAELLA! So time your market visit around 11am and get a taste yourself. PS. 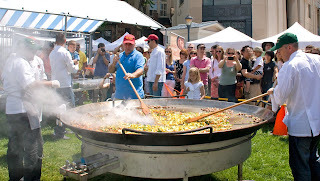 If you can't make the Sunday Dupont Market, Chef Andres will also be making the giant paella at the Crystal City Farmers Market on Tuesday, June 1st at 4:30pm. Hello, I was trying to see where I can get information about a paella making contest for 2014 in Tampa and if there will be one.